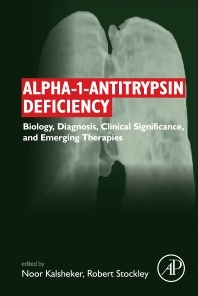 Alpha-1-antitrypsin Deficiency: Biology, Diagnosis, Clinical Significance, and Emerging Therapies is the authoritative reference on AATD, providing standards for diagnosis, monitoring, treatment and appropriate avenues of research. The book covers the disease from basic biology and epidemiology, to clinical impact, and includes the understanding of the natural history of the disease and the significant advances that have been made in the last 20 years, including the three-dimensional structure of the molecule, its broad biological activity and improved therapeutic options, including replacement therapy and gene therapy. The editors have recruited international experts in the field to contribute evidence-based chapters and insights on future developments in the understanding of this disease. Professor Kalsheker is the Head of Division and Co-director of the Institute of Genetics and teaches in the School of Life Sciences at the University of Nottingham. His work is focused on the study of humoral control of genes of the serine proteinase inhibitor family which regulate key biological pathways and how functional genetic variants contribute to complex diseases such as chronic lung disease. Professor Stockley has a longstanding interest in chronic obstructive pulmonary disease (COPD) with special reference to airway inflammation, proteinases and anti-proteinases, and especially the role of the neutrophils, bacteria and exacerbations. His research focuses on investigating the factors governing neutrophil differentiation, activation and recruitment as processes that determine the degree of tissue damage resulting in the establishment and progression of chronic lung disease.